THE WRITING BUDDHA - Opinions | Books | Movies: jangshersingh.com by Vishal Bhatia (Book Review: 3.75*/5) !!! jangshersingh.com by Vishal Bhatia (Book Review: 3.75*/5) !!! When you pick up a book to read on a weekend, it needs to be special. Hence, I always pick a Bestseller to make sure that my weekend is not wasted. This time, I picked up an Indian debutante, Vishal Bhatia's first book, named "jangshersingh.com". The title is unique but I was very skeptic about the plot and writing style of the author initially. But as I progressed reading it, I found that author has surely invested a lot of time in making this book as perfect as possible. I am glad to find a book without any grammatical and spelling mistake by an Indian debutante after a very long time. The book has been edited well. And even though the book is almost 350 pages, it keeps you excited till the end. 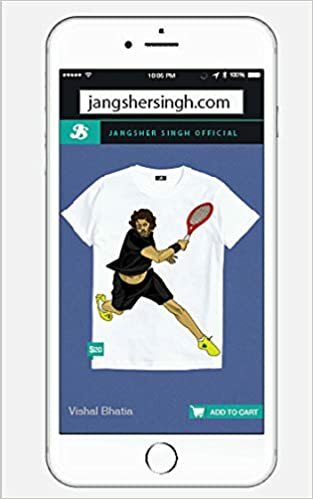 jangshersingh.com is a sports fiction novel and any book that's based on sports need a very well paced description of the minute details happening during the play. Vishal has been able to capture those moments very well in this book which makes the second half of this book something which you will never ever forget if you are a reader looking out for segments which makes you jump in excitement. The masterstroke in the game of lawn tennis happens in a blink of eye and writing those sequences could have been a challenge even for an experienced writer and a debutante managing it so well is impressing. The best USP of this book has been the characterization of the legend players against whom Jangsher plays in the Grand Slam. You can actually imagine the backdrop and personality of each player. Kudos! The first half is little boring when the whole story revolves around how two boys are trying to get their car back from a brutish thief. It becomes unexciting after a point of time. But initially the way Jangsher's character has been developed and how he adapts a furious personality in the court is also done perfectly. The emotional scenes are also heart-touching and you can feel for the protagonist each time he goes through a tragedy. Coming to the drawback of the book, I found the language very difficult to adapt initially because it's written more in western style than Indian. Also, writer has chosen to write big sentences sometimes which makes it hard for the reader to read in flow. I would suggest him to keep sentences short and crisp. Rest, if second half is 100 then on that scale I would rate first half of the book only 50. There shouldn't be such fluctuation in quality of narrating scenes. Rest, this book is amazing. You will surely start following tennis in case you have not been following in all these years after reading this book. And I am very keen to check out what this author is going to try in his second book as he surely possesses some great writing skills. I give this book 3.75* out of 5.